OLYMPIA, Washington, June 7, 2010 (ENS) – Fishing businesses and conservation groups filed suit Thursday against the Washington Department of Ecology, saying the agency has failed to protect endangered salmon by preventing water releases over dams on the Columbia and Snake Rivers. The lawsuit, filed in Thurston County Superior Court, follows the Department of Ecology’s recent decision to deny a petition filed on behalf of the Pacific Coast Federation of Fishermen’s Associations, Northwest Sportfishing Industry Association, the Association of Northwest Steelheaders, and Idaho Rivers United to change the standards governing how much water may be released over the dams. The groups are represented by Earthjustice, a nonprofit public interest law firm. The original petition, filed March 8, sought to allow the U.S. Army Corps of Engineers to release more water in greater volume than is permitted under Washington’s current restrictions. The plaintiff groups argue that increasing the amount of water spilled over the dams increases salmon survival by allowing more fish to avoid dying in the dam’s turbines as they make their from the streams where they were spawned to the ocean where they will grow and mature. “I am fed up with Ecology’s willingness to allow the hydro system to kill too many endangered fish and ignore both science and economic reality,” said Glen Spain, northwest regional director of the Pacific Coast Federation of Fishermen’s Associations, a trade organization for West Coast commercial fishing families. “This case seeks to give salmon more of what they need to survive, as well as help the coastal and inland communities that depend on those fish for their livelihoods,” he said. “We have spent too much money and put in too much effort to bring back our Columbia Basin salmon and steelhead to stand by while Ecology denies the public’s fish their best chance of survival,” said Norman Ritchie, government affairs director of the Association of Northwest Steelheaders. This year’s salmon returns have been strong, and the groups say this demonstrates that the more natural river conditions created by water releases ordered by the court in a previous lawsuit is helping to bring more salmon back. This year’s run has so far supported sport and commercial fisheries in the Columbia River at a time when the rest of the West Coast salmon fishing has been a disaster, the groups say. The implementation of court-ordered water releases has improved fish passage conditions since 2006, and has played a significant role in increased salmon and steelhead returns in the past several years, they say. Even in low water conditions, releasing water over the dams has helped produce some of the best returns of salmon and steelhead seen in many years. 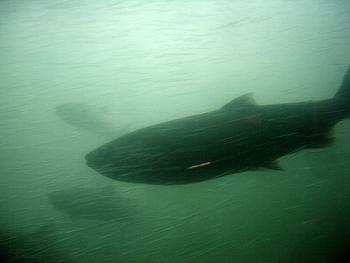 While these improvements in river operations have helped more fish survive, the plaintiff groups say they are not enough to eliminate the decline of many Columbia and Snake River salmon stocks. “By preventing the release of more water for spill over dams, Ecology is ignoring the number one tool available to help our Northwest salmon economy recover and become strong again,” said Liz Hamilton, executive director of the Northwest Sportfishing Industry Association. Water releases over the dams on the Columbia and Snake Rivers are currently “artificially constrained by Washington’s unnecessarily restrictive total dissolved gas standards,” the groups argue in their lawsuit. Washington’s standards allow a total dissolved gas level of 120 percent in the area immediately below a dam’s spillway, but the plaintiffs argue that the standards “erroneously” restrict it to 115 percent in the area just above the next dam downstream, known as the fore bay. The fishing businesses and conservation groups want Washington to remove the 115 percent fore bay total dissolved gas limit or increase it to 120 percent. The state of Oregon has recently dropped the 115 percent fore bay limit to increase fish survival. Washington has so far declined to follow suit.